A backpack and a helmet saved our son’s life. Well… we’re pretty confident that God had a hand in it too. 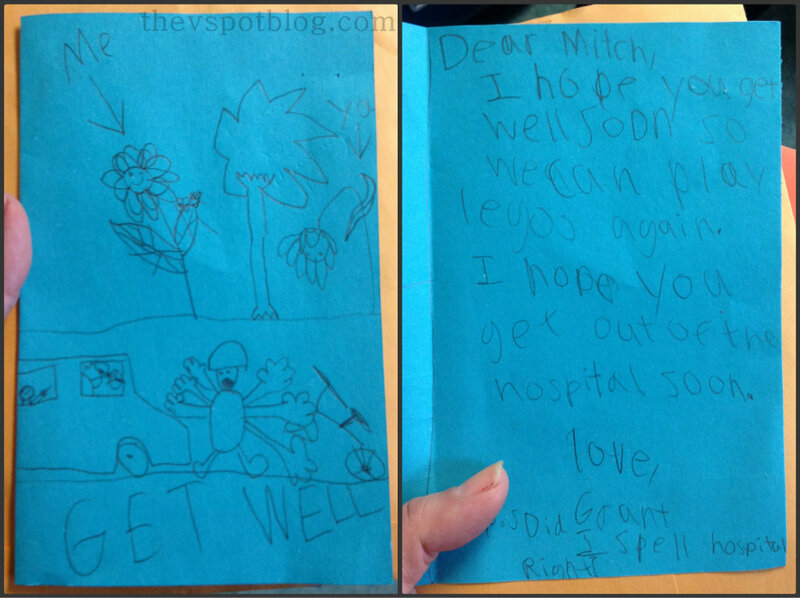 Last week our son Mitch was hit and then run over by an SUV on his way home from school. The support and prayers from our friends, family and community has been overwhelming. And the support coming from all of you and from the blogging community has been equally amazing. So many people have been asking about what happened (and how it happened) and how they might specifically pray for us, that I wanted to give you the scoop. Last Wednesday, January 30 Mitch was riding his bike home from school. He was on the sidewalk, surrounded by lots of other students from the high school. There is a restaurant parking lot, and Mitch slowed down/stopped to let a car pull out of the driveway and onto the boulevard. When it had passed, Mitch and other students proceeded down the sidewalk. However, there was a Suburban in the parking lot that was coming up after the first car, and for some reason it sort of lurched forward and hit Mitch. It knocked him over on his bike and then both the front and rear wheels on the passenger side rolled over his chest. I’m telling you, it’s a miracle that the child is alive. He said he was conscious the entire time and was aware that he would need to try and protect his vital organs. He was on his right side (I’m guessing the fetal position…) and fortunately, he was still wearing his backpack. For years, I have complained about these ridiculously heavy backpacks that the kids have to lug around. In this instance, that ridiculously heavy backpack served as sort of a ramp that allowed the SUV to roll up and drop down over Mitch, instead of outright crushing him. I repeat: It is a miracle. It is a horrible, horrible thing to receive a phone call from the police department, informing you that your child has been in an accident (specifically: “Ma’m, your son has been hit by a truck. You need to meet the ambulance at the emergency room immediately.”) and not have them be able to tell you his condition. I hope you never have to get a call like that. I was shaking so much and so upset that I would have been a hazard on the road, so I called my friend Jodi and she drove me. I called HH and let him know and he called Mitch’s mom. (Mitch is my step-son, remember?) Mitch’s mom had the same reaction that I did and she needed a friend to drive her as well. Mitch’s step-dad is an EMT and as it turns out, he wound up being a first responder at the accident site. While I am sure it was a shock (and probably traumatic) for Step-Dad to get a call and have it turn out to be a member of his family, I am so grateful that Mitch had someone there that he knows and loves. What a comfort! Mitch had a compound fracture in his upper left arm (humerus), a fractured clavicle and scapula, fractures in his pelvis, cracked ribs, a partially collapsed lung and a HUGE case of road rash on his right arm and hand. (It may need a skin graft, but hopefully not.) He was moved out of ICU and into a regular room last night. Progress! Did I spell hospital right….? Love it! Surgery was necessary to repair the damage the compound fracture caused, but all of the remaining fractures and injuries will only heal by remaining immobilized. That means that Mitch will be in a wheelchair for the next 4 to 6 weeks. We’ve ordered a hospital bed for his room, and we will have to move him from the bed to the chair and back again. He cannot put any weight on his arms or on his right leg. It is going to be a long road back to recovery, but we welcome it with grateful hearts. We could very easily be planning a funeral right now instead of rearranging bedroom furniture to temporarily accommodate medical equipment. If you’re the praying type, we’d love for you to pray for Mitch’s continued healing and strength as he heads down what will likely be a difficult and painful road to recovery. As a parent, I’d ask for prayer that we 4 parents (Mom, step-dad, dad and me) have strength and composure as we work together to care for Mitch during this time. No matter what we face in the next few months, we’re confident that we’ll get through it with God’s help, and we are grateful for our son. So hug your kids, hug your spouse, and remember that we need to make the most of each day we have here. Each day is a gift… we need to always remember that. Please bear with me as I find my equilibrium. I have some fabulous guests lined up over the next few weeks, I hope you’ll enjoy! Take care, thanks for reading, and thank you for your continued support. Mitch is doing really well. He’s home, he’s in good spirits and is working hard at his physical therapy and it only takes one person to help him out of bed and into the wheelchair. He can only put weight on his left leg for now, but we’re hoping he will be up and about in about 6 weeks. What an amazing story. For a bad situation everything went as well as it possibly could. Continuing to pray, prayers of thankgsiving for his progress this far, and prayers for healing in the future. Also, for those of you directly affected, prayers of peace. What a miracle, indeed, Viv! We’re the praying type, and we will be! It’s an amazing story. Thank you for sharing your miracles. Love you! Viv–thank you for sharing your story with us. Ever since I saw your post on Facebook last week I’ve been sending lots of prayers to your family. It is truly a miracle that he is still alive. Oh, Viv, I cannot even begin to imagine all of the emotions you have been going through. I would be a serious hot mess by now. You and your family are an inspiration! I will keep you all in my thoughts and hope for a speedy recovery for Mitch. This is a miracle indeed! I am so grateful that Mitch is ok and will be praying for quick healing for him and strength for you and your family as you work together to help make Mitch’s road to recovery as quick and painless as possible. Big hugs to you Vivienne! Oh, Viv ~ your story gave me chills. I am so thankful that your son will be okay. I’ll be praying and I do know (just like you) that God is good. Whew…. He and your family has been lifted up in prayer. Wow. Just wow! I cannot even begin to imagine getting a phone call like that. What an amazing kid Mitch is to have the presence of mind to protect himself as best he could. Grace under fire for sure! I currently have one broken rib that hurts like all get out. The pain he’s in must be incredible but look at that smile!! I wish all of you all my best! As you said we all live in dread of getting that call. I am so glad he wasn’t hurt worse. Will there be charges against the driver? What a story! It definitely wasn’t his time. Sending prays for a fast recovery! Love you Vivienne, and keeping you all in our prayers. I’m so sorry this happened to your family, and at the same time I’m grateful that it wasn’t worse. I know I’m kind of far away, but if there’s anything you need that I can do, even just a listening ear – I’m here. Praying for Mitch (and your entire family), for healing, speedy recovery, patience, humor, laughter, love, grace, calm, and peace. And praising God for this miracle! Once again I want to hop on a plane and come and hug you. Know that I’m praying! Prayers for you and your, so glad he is “ok” and that he is improving. Good luck. It’s every mother’s nightmare, what you went through. 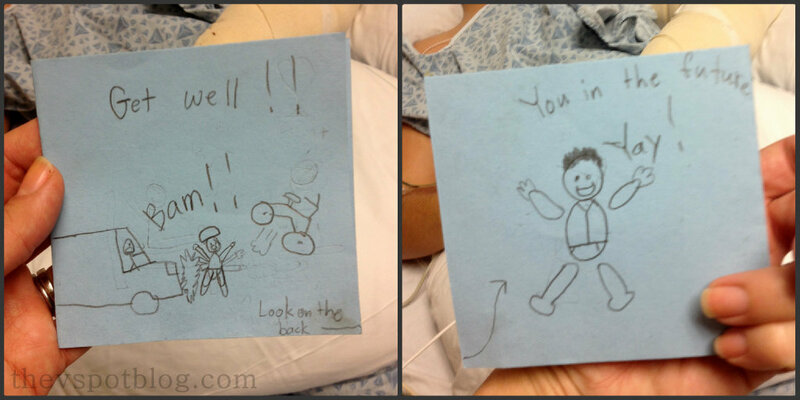 How just a moment can change everything – and fortunately, your son is ok, thank goodness. Thanks for sharing his status – and yours too. I’ve been thinking about you. I’m so very grateful for you and your family that Mitch is going to be okay. What a scary thing for all of you! I will definitely keep all of you in my prayers for a speedy and full recovery. What a miracle! So happy to hear he is ok and on the road to recovery! Prayers for Mitch and your family! Our Lord Jesus Christ was there first, in order for him to have his helmut and back pack on and that was the miracle!!!!!! Blessings for Mitch and his family! Wow Vivienne what a miracle! I will pray for your family. My sister-in-law was hit by a car last week. What’s the deal? I wonder if people are texting or on the phone. I know as a mom our kids are our world. So thankful you have a happy ending! I will continue to pray for his healing! I’m sitting here at my cubicle at work (sneaking in some personal blog time on my phone) in tears as I read this. I am also a stepmom (of a ten year old), we are 4 parents as well, and I can imagine how scary that phone call was. I am the ‘praying type’ and will most definitely keep Mitch and all four of you parents in my fervent prayers as he recovers. Truly a miracle, God was with him that day, and will always be. God bless you guys! So glad to know that he will be alright. Yes, there is a long recovery ahead but with all the love and prayers your entire family will pull through. God’s love and intervention is truly a blessing. Oh my heart sank into my stomach as I read this. My prayers and thoughts are with Mitch and all of you his parents. He is blessed to have such a strong and loving support system. My daughter had a burn on her right upper leg last september. We had 2 weeks of horrible bandage changing and cleaning the wound. But after those 2 weeks it was over. The skin was closed and now it only needs to get the right color, she even gets goosebumps on it so it’s ok! Here in the Netherlands helmets are not required if you ride a bike. But we want our kids to wear them. Even if they get bullied about it, I won’t let them go without anymore! It’s one more accident that proved what they are good for! I literally thanked God for saving this boys life and to be an example for many more kids. WOW! i just read this and had tears in my eyes, i was so sorry to hear it but glad that he is ok and on the way to recovery! I read so many parts of this story over and over because it is just amazing and wonderful that he survived, stayed conscious and is already starting his recovery. I cannot even imagine getting that phone call and I hope I never have to experience it. So very happy for your complete family tonight. Oh.my.goodness. I cannot believe this happened. Thank GOD he is ok! what a miracle. And thank god for that backpack and helmet!! He is a trooper and he’s going to get through this recovery with flying colors. Prayers for your whole family are abundant in my home. I cannot say enough times Thank GOD he is ok.
You all definitely have my prayers!! Keep calm and be kind and helpful to one another! What an amazing story! i will be praying for Mitch and all of your family! That is a miracle! Oh my goodness. I’m so glad he’s going to be OK, knowing that things could have been much worse. Someone was definitely watching over him. Sending plenty of healing thoughts his way! I’m in tears. Your post takes me back almost exactly 5 years when I got a similar call about my brother. He too was very lucky. Praying for you all through these upcoming months. Please reach out if there is anything I can do. My prayers are with your family. Such a terrible phone call to receive. Thank Goodness for the helmet and the backpack! I’ve been catching glimpses of your story on instagram and other social media and had to come on to find out what happened. I’m SO glad he’s going to be okay. I can’t even imagine getting that call. Praying for a perfect recovery for Mitch. I don’t know how I missed this post but I did. I’m sort of happy I found it a month and a half later because I got to start with all the good news.